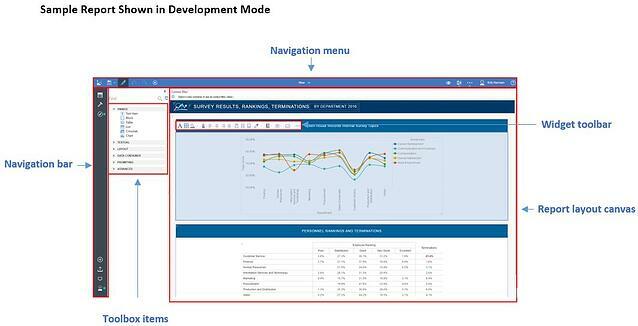 As mentioned in the previous blog post, the new release of Cognos Analytics presents an entirely new experience across the IBM analytics professional spectrum from consumer, to report/dashboard developer, to data modeler. Perhaps the most exciting and compelling changes are experienced by individuals actively curating, developing, and sharing analytics in Cognos. The dramatic UI/UX changes fall into several core buckets: ease of use/user empowerment, quick access to advanced development capabilities, and data discovery. The new release of Cognos Analytics focuses heavily on an improved, user-first experience. Upon logging in, content is immediately accessible for either consumption or development (no more Cognos Connection!) An integrated development environment (RIP Report Studio and others!) provides all development capabilities in a single “studio-less” environment. The barrier between development and consumption has been removed. The new integrated development environment removes the constriction of having to learn, navigate, and support different tools. These changes alone represent a revolution of how IBM does analytics. The new environment is much leaner, intelligent, and intuitive. User interaction is now built into reports by default with the use of “widgets.” Widgets are not new to Cognos, and if you’ve worked with Workspace or Cognos Insight in the past, you have probably worked with widgets, and they do take a much more prominent role in the new release. Individual widgets (containing reports, graphs, charts etc.) can be filtered, sorted, aggregated etc. by the end user, and all widgets in a report respond dynamically and in sync to other objects on the page. This is “out of the box” functionality - no development or configuration needed. Cognos Analytics also makes it easier for the end user to subscribe to content and specify preferred delivery methods and frequency. This approach to active adoption seems simple, but fundamental to the future of analytics. The new Cognos Analytics not only provides an improved, more interactive experience for the report consumer, but also allows analytics developers to quickly, efficiently, and repeatedly deliver high impact intelligence. These features, along with a minimization of icons and menus and contextually presented features/functionality, remove a lot of the visual and spatial noise that can be part of analytics development. When there is a need to go deeper into development, the advanced development capabilities are readily accessible. Through the use of graduated capabilities and Edit mode, developers can get access to all the Toolbox items, data packages, report pages, queries etc. It’s also worth noting, that as soon as a report or dashboard is saved in Cognos Analytics, it becomes immediately accessible via the search functionality. This means no more indexing is required! The removal of search index is just one indication of a noticeable embracing/emphasis on data discovery. The new smart search makes it very easy to find data items in a data source by using natural language selection. As search terms are entered, Cognos dynamically returns and related data item(s) in the data source. Data discovery is further supported by a much-improved offering of template based, report starting points. These templates are all designed using best practices and provide optimal presentation options to promote deeper analysis of the data, while utilizing more modern visualizations and enhanced chart types to offer new ways of evaluating data. Data sources are immediately accessible for exploration. For example, dragging and dropping package data items on top of each other will automatically create calculations and/or suggested presentation options, visualization types etc.